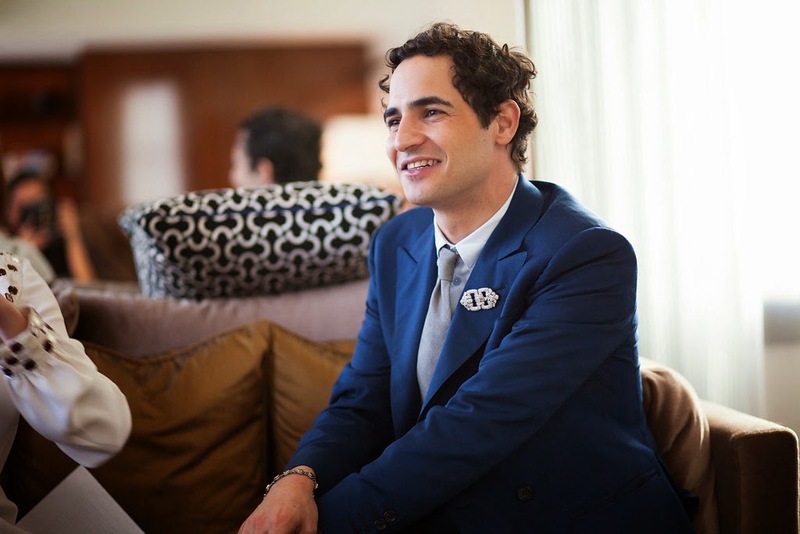 I caught up with Zac Posen at a luxurious penthouse at The Joule hotel on Thursday afternoon. He is in town for a few days (primarily) to accept an award from Fashion Group International (FGI) Dallas but like any good entrepreneur was taking full advantage of his time here and had spent the afternoon wining and dining some of Neiman Marcus' top customers and socialites like "Fancy Nancy" Rogers, Anika Call and Kristie Ramirez. Posen will be bestowed the Career Achievement in Fashion Award at one of Dallas' hottest events this Friday evening at FGI Night of Stars gala. Other honorees will include Todd Fiscus who will receive the Career Achievement Award in Event Design and Lisa Dawson who will be honored with the Career Achievement Award in Business. In addition, DALLAS star Linda Gray will receive the Lifetime Achievement Award and Nancy Rogers will be presented with the Art Patron of the Year Award. FGI supports fashion student not only with funds, but with connections to others in their fields of interest. I believe that no matter what station or stage of the game you are at, it is crucial to have people who believe in you and support you on your journey, so I asked Zac to tell me who a few of his early mentors had been and what they meant to him. "I've been really fortunate in my career to have had many mentors. I've always been drawn to people who are magic - I call them my angels." He credits Bloomingdales Kal Ruttenstein for being one of his first big supporters and says that he saw more in him than Posen saw in himself at the time, taking him to dinner sometimes twice a week early on in his career to offer him guidance and nurture him. He called Vogue's Anna Wintour "an instrumental force" in his career saying "she has a level of excellence that is outstanding and has given me some of the best, and hardest, advice I've ever gotten." He credits Dallas' own Neiman Marcus for taking him under their wing and having a huge impact on his success. "Ken Downing took me on the road when I was 21 and that's how I saw America and learned who my customer was," he mused. What's his advice to emerging designers? "Fashion is a journey. It's not an overnight thing. It's about being a long-distance runner - it's a marathon." Who taught him about the process and art of the show? Madonna. I guess she knows a thing or two about career longevity. Another piece of advice? Learn about the business side of the creative process. "There's a creativity to numbers and how it works together with the creative vision. And if you understand that, you have a magic symbiotic relationship and then you can move forward. If you are not in touch with reality as a creator, then you're not in touch with your customer." So, who is the Zac Posen woman I wondered? "She embraces her inner glamour and likes to have that expressed," grinned Posen. "She's confident. She has an appreciation for craft and through the drama, construction, glamour and chicness of the garments (she wears) can express her own creativity." Sounds like Dallas women to me! Zac says he LOVES Dallas and our "great American spirit" and sense of fashion adventure. He likes that Dallas women aren't afraid to wear color, take fashion risks and express their personality through clothing. We closed our chat with a few rapid fire questions and here's what I gleaned about Posen: His favorite cocktail is a Bloody Mary. His favorite social media platform is Instagram (follow him at @Zac_Posen). His favorite car is a Rolls Royce because they change the body style of the seats periodically to accommodate the fashions of the time and he loves to cook in his down time because he loves to use his hands to create and "food brings everyone together". In addition to his own line and his gig as a judge on the monster hit TV show Project Runway, he has recently partnered with Blue Nile, the original online jeweler, to create a stunning collection of engagement rings and fine jewelry. This is the designer’s first foray into jewelry which is inspired by his meticulous craftsmanship and innovative designs. Posen has also just been hired as the creative director for Brooks Brothers’ to oversee their signature women’s collection and accessories. His first collection for the brand will hit stores in Spring 2016. He tells me "there will be no themes. I am creating classic American styles!". Stay tuned for Part 2 of my Zac Posen adventure. I will be backstage at Friday's FGI Night of Stars gala bringing you all of the red carpet looks, gossip and fashion drama! Thank you to Stephanie Drenka for taking these fabulous photographs for me!